WordPress 5.0 is scheduled to be released today, and with it comes some very big changes. WordPress 5.0 introduces an entirely new post editing experience. This new editor not only replaces TinyMCE, but the entire post editing page as well. For many, this change may seem jarring at first glance. The good news is that you don’t have to jump head first into the new editor. The Classic Editor along with the Classic Divi Builder is still available (keep reading to find out how). The latest versions of Divi, Extra, Bloom, Monarch and the Divi Builder are compatible with WordPress 5.0. It’s important that you update Divi to version 3.18+ before updating WordPress to version 5.0. This version addresses many compatibility issues with the new Gutenberg post editor and will allow you to toggle the Divi Builder and hop into the Visual Builder. This update also addresses issues with the new meta box system, which is used to display Divi page settings and post format options. In addition, post format support has been extended to account for new Gutenberg content types (such as video and audio blocks). You can update your theme and update your plugins using the standard WordPress update system. You will also need to enter your username and API Key into your theme option and plugin option panels. If you are not receiving an update notification or are having trouble updating, then you can also download the latest product versions from the members area and upload them manually. Using the Divi Builder with WordPress 5.0 is a little different than previous versions. You will notice that the overall design of the post editor has changed, and that a new box appears when creating new pages that will allow you to choose between the Divi Builder and the standard WordPress post editor. You can switch between the two at any time. 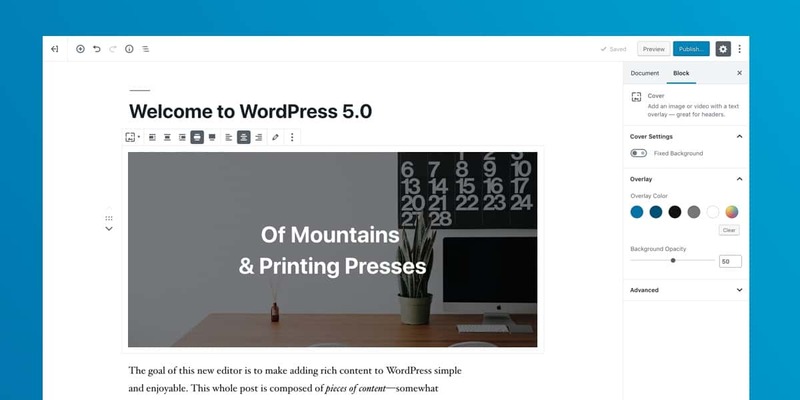 WordPress 5.0 replaces the Classic Editor with an entirely new post editing experience. 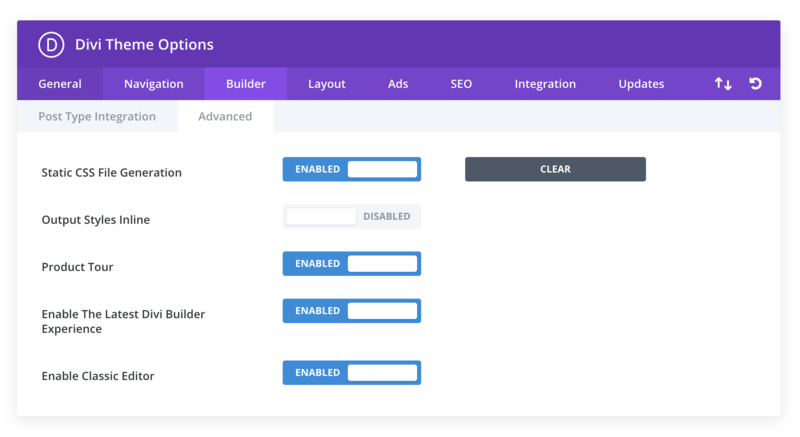 Along with the removal of the Classic Editor comes the removal of all connected applications, such as the Classic Divi Builder. After updating to WordPress 5.0 you will find that the Classic Editor and the Classic Divi Builder (aka the Backend Builder) are nowhere to be found. But don’t worry, you can still use the Classic Editor and the Classic Divi Builder by installing the Classic Editor Plugin. 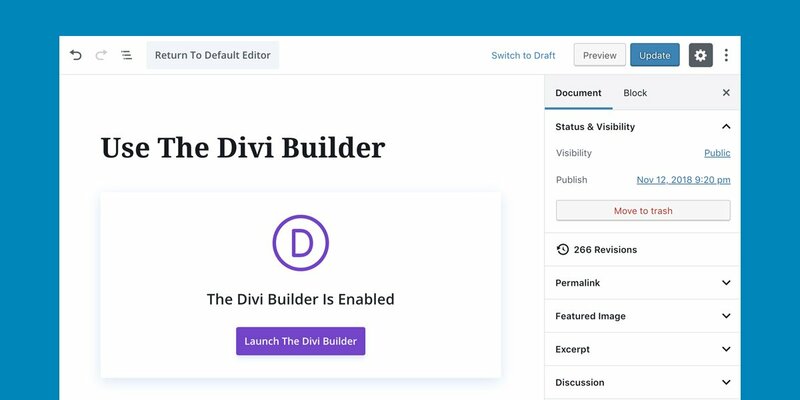 This will disable the new editing experience and allow you to access the Classic Divi Builder. If you are not ready to use the Visual Builder, or if you are not ready to use the new WordPress 5.0 post editor, that’s ok. You can simply install the Classic Editor Plugin and your WordPress website and the Divi Builder will function just like it did before you upgraded to WordPress 5.0. You can use as much time as you need to familiarize yourself with the new system, and we will continue to support both the Classic Editor and the new Gutenberg editor moving forward. 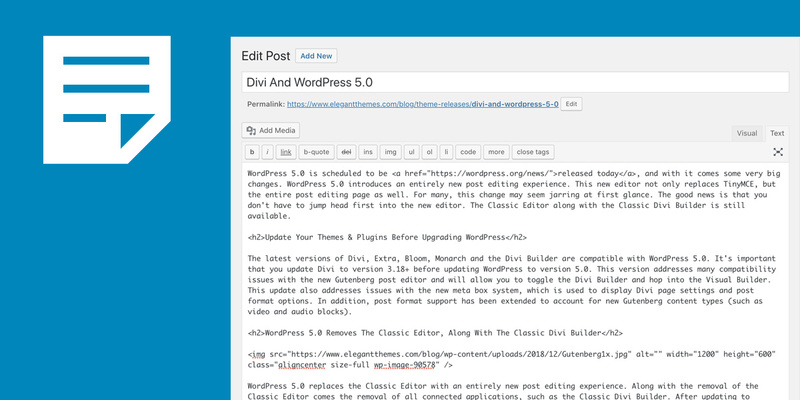 You can also disable the new WordPress post editor and enable the Classic Editor within the Divi Theme Options. If you are using WordPress 5.0 or above, a new option will appear in Divi > Theme Options > Builder > Advanced. Even Better WordPress 5.0 Support Is Coming! For now we have been focused on fixing important bugs and addressing basic WordPress 5.0 compatibility for Divi and our other flagship products, but the story does not end there. We have three additional stages of support planned for the coming weeks, and the ways in which Divi integrates and interactions with Gutenberg will becomes more advanced and more seamless in the near future. The post Divi And WordPress 5.0 appeared first on Elegant Themes Blog.